On Wednesday morning (August 4th, 2010), Truman and I had a bit of a disagreement. I took him out of his cage for his customary morning poop. For ten minutes he sat around on his perch and didn't do anything. Then he suddenly flew off and landed on my windows shades and released an all nighter. This was much similar to a previous episode of this. Thus I ended up spending all morning cleaning poop out of my blinds again and by the time I finished I was in a rush to get to work. Every time I went to try to get Truman he'd fly off and things turned into a nasty chase. The more he flew away, the more effort I exhibited to get him which in turn made him flee reflexively. The chase terminated in a exhaustion and a crash. Truman no longer tried to get away. I picked him up, comforted him briefly and put him away in his cage. For the remainder of the day Truman appeared lethargic and was closing one eye much of the time. He did not eat a thing in the morning nor in the evening. I began to worry that he became sick either from too much stress getting chased in the morning or possibly from my bird store visit several days prior. I decided to let him sleep on it and see if he improves over night. By the following morning when he did not touch his food, I decided immediately to take him to the vet. Instead of going to my local vet, I took him to a specialized avian vet in Manhattan and over an hour away. They had a nurse take a look at him almost immediately to determine that he is in stable enough condition to allow the doctor to finish a previous animal before examining Truman. After a brief wait we entered and I explained the scenario. I told about how I suspected his drastic behavior change to be either illness from bird store, stress from chase, or possibly injury. Truman stood the entire exam on a single foot and limped when trying to move around. The previous day he did not exhibit so much difficulty in the foot so I was not as concerned that it was injury. However, by this time it was much more apparent. The vet determined that Truman had hurt his leg and that if anything, the pain was coming from higher up. I was in a difficult position with a wedding I had to attend over the weekend and no ability to provide him special care and attention. So I decided to have Truman taken care of by the office until Sunday. I came back to visit Truman Thursday night, Friday morning, Saturday morning, and then picked him up on Sunday night. After an xray it turned out that Truman had a fractured pelvic bone on his left leg. The vet explained that there is really nothing they can do about it but that the good news is that it should heal on its own. The first day they fed Truman soft food and injected him with liquids but by the next day he was already eating pellets on his own. I had brought a bag of his normal pellets with me when I dropped him off and left those so he'd have a familiar food. On the second day of Truman's stay, I came to visit bringing an almond for him to munch on. He devoured it right down and was looking much more alive than he was the previous days. He was finally a bit more alert looking and making some of his customary sounds. I continued visiting him and noting small signs of improvement. Today I picked him up and brought him home. The office provided me with medication to give to Truman for the next 5 days. It is an anti inflammatory and pain killer which should aid the healing process. I had to set up a special living area for Truman for the next few weeks. Truman can't go back into his cage for a while because he needs to avoid climbing in order that his hip can heal. So I set up a large plastic bin with a low perch and steep sides. This way he cannot climb up the sides and has little room to walk around. Truman needs a good few weeks of rest so that he can improve. I also made a special lid with a wire mesh for the top. It is as much my fear of Kili getting into Truman's tub as it is for Truman to get out. There is no way Kili/Truman can climb in but they are both flighted and I won't be taking any chances. I leave his tub uncovered when I am home but will cover it when I am not. So five days and $600+ since Truman's injury, things are starting to return to normal. Truman won't be able to fly around or do tricks for a few weeks but I am glad that his injury should be recoverable. I will be feeding him calcium rich foods like spinach, broccoli, almonds, and yogurt if he accepts in addition to his pellets. If not, he can have lots of almonds. He normally has one a day as it is and the extra fat shouldn't be an issue considering he's under weight now as it is. Surprisingly I've learned that almonds are a great non-dairy source of calcium. I have learned a few lessons in this whole process. Obviously I learned that you can't take things too far with a bird and it's important to keep a low stress environment so they can think with their head rather than get out of control in an enclosed space. It is my fault for pushing Truman too far and assuming he was as tame as Kili. However, I also learned that good vet care is available (albeit at some distance and expensive cost) and should be used when necessary. 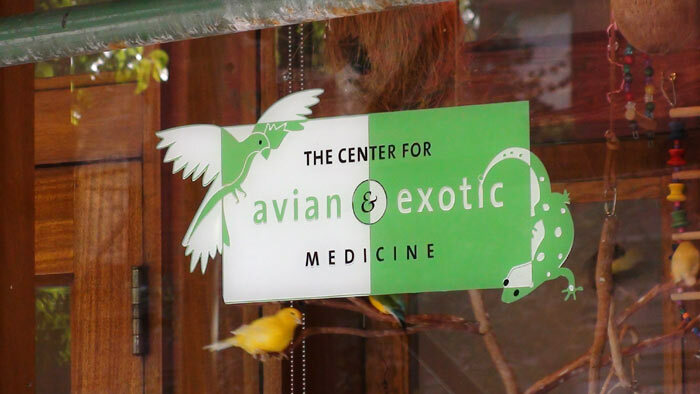 I am really happy with the Center for Avian & Exotic Medicine in all regards including their level of expertise, specialization, quality facilities, and friendly staff. Welcome home Truman! I'm glad he's feeling better and got good-quality care at the vet's. 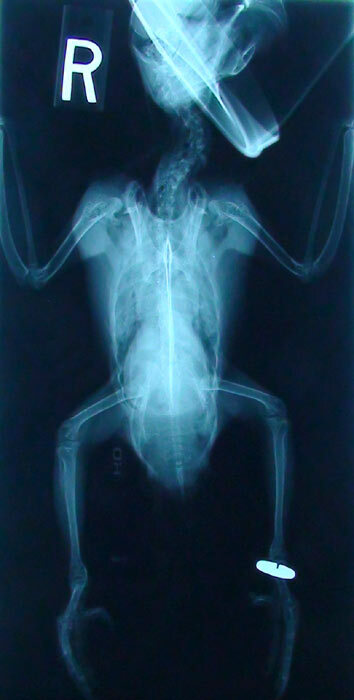 And thank you for posting his xray - despite the circumstances, that is pretty cool to see! All the best to you and your flock. Poor baby Turman. My heart goes out to you Michael. I am so sorry that you both had to go through such an episode. I appreciate that you took the time to make the video, write the article and post the story for all of us. Your commitment to your "fans" never ceases to amaze me. It is good to know that the injury will completely recover on it's own. That Metacam is great stuff. 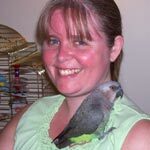 I've used it before on several of my birds, and those that I've rehabbed for the rescue. It really helps take down the inflammation and reduce the pain to make the bird more comfortable. I'm glad you were able to find an avian vet. I don't know what I'd do without mine! Here's hoping for a complete and speedy recovery. Get well Truman. Glad to hear that Truman made it home safe and sound and is on the mend. Agree with Ginger. Was wondering what happened since nothing for a week. Glad he's ok. Poor thing. 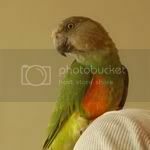 He's lucky to have you, and well you are lucky to have good bird stores and avian vets not too far away. My guys' avian vet is about 45min - an hour away. There is nothing in between so in the event of an emergency I'm afraid they would be hosed since regular vets just don't know enough about birds if they even do! Poor Truman but I am glad that he is on the mend. Harrison's pellets will be the best for him and has a good amount of calcium. Do not feed him spinach because the oxalates are high and will actually draw the calicium out by binding with it. The better greens to give are collard, mustrad, arugula, dandelions and kale. 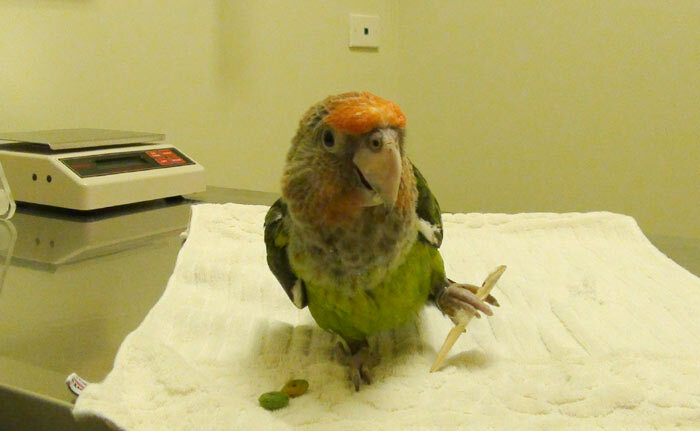 Jupiter had an accident while playing last week and fractured the end of his beak. When it happened he was playing and I heard a thump. I went to find out if he was okay and he was completely freaked out and in a full panic. I had to eventually trim his flight feathers a bit so I could keep him a little calm. I couldn't find anything wrong with him so gave him 24 hours to see if he would get better. By the next day he was fluffed, not eating and had lost 30g, so off to the vet we went. The first thing the vet did was check his beak and the very end bent like rubber and Jupiter let out such a scream. He must have been playing and landed wrong on his beak breaking the end. 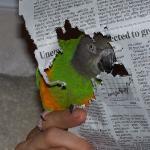 The vet said that with Capes their nerves go all the way to the tip of their beaks so breaking it was very very painful. He got some fluids, a shot of pain meds and they trimmed it back. He stayed on pain meds for a few days and now a week later he is back to his rambunctious self. Let Truman know he has to just be patient and not get to crazy until he is healed and give him a big kiss. I'm glad to hear you have him home! Hope his recovery goes well! That is what the vet said about the nerve endings, maybe after they get trimmed back then the nerves retreat but I am not sure...I will need to ask him. 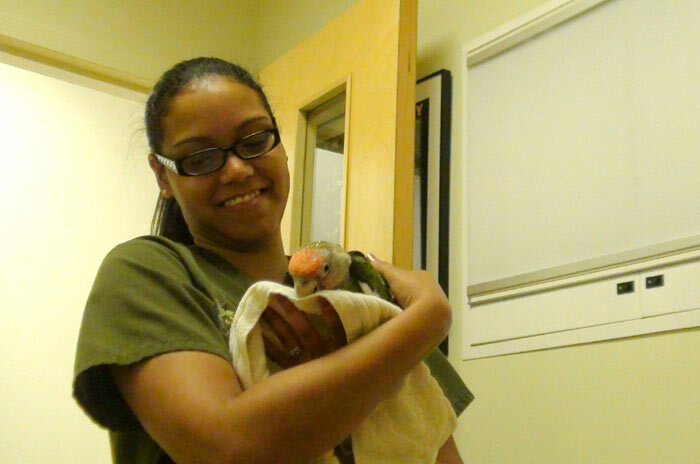 He is a very good avian vet, Jeffery Jenkins, and luckily he is right down the road. Jupiter took about 6 days to get back to normal and after a day on pain meds, Metacam, he was eating normally. For Jupiter's regular diet he gets Harrison's High Potency, loves almonds and pistachos as well as cracked walnuts, nutriberries, sprouts and then fresh fruit and veggies. The vet said that the Harrison's is fine since he is also eating so many other things. He also gets seed mix that we make in store and cooked mixes. I try to give everyone a large variety. All the dry mixes we have on our on-line store on our website. You could ask your vet if there is anything you could give him to slow him down a bit. Can you give him some foot toys to work on? Glad Truman is doing ok. Poor thing. You just keep pampering him and everything will turn out great! I just wanted to mention how thrilled I am with the vet place I brought Truman to. Indeed they are expensive but they provide excellent care and follow up. So while the up front cost was high, all my visitations and follow up calls were without charge. I visited Truman there four times and that is of course work for them. Also, they promised to give me a follow up call Monday. Unfortunately we ended up playing phone tag for several days but finally we got in touch today. In fact they called me. We established the home recovery course for the near future. 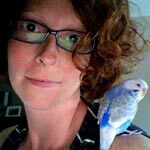 I am just thrilled that they WANT the animal to do better and to help you out (rather than having to be a tough customer and keep asking, calling, etc). I highly recommend the place to anyone in the NY area. The higher cost is well worth it in splendid care and support. Its unfortunate that you needed their services, but its good to know that there are vets that truly care about the well being of the animal. Just checking in to see how Truman's doing. Its been a few days since your last update. He's slightly better. I've noticed more use of and strength in his bad leg. I had him out a little bit and he was able to stand on one leg or both. I also got him to step up once but he flapped himself onto my hand so he must still be feeling pain from stepping hard on it. I talked to the vet a few days ago and was basically told that at this stage, this is the best sign of healing. That is more grip/strength in the injured leg. So there isn't any drastic change going on in our routine but he's doing alright. Here's a video of Truman taking his medicine: CnkJCbcufXc[/youtube:e8mevpve] http://www.youtube.com/watch?v=CnkJCbcufXc Just one more day of medicine to go. He seems to be moving around a lot better. Looks good! Hi Michael. My computer crashed and I finally just got it back - yours was the first email I read. I was devastated to learn about your little baby and I can just imagine how you must have been feeling! Alas, accidents do happen with even the best care! I'm so glad Truman is getting better so quickly - I just think he's a little doll! He's so good taking his medicine - and he's so lucky to have you! Truman has been getting worse the last few days since I took him off the medication. He's been refusing to eat lately and been acting a bit strange. Apparently the previous dosage was wrong so I have to bring him to the vet today and get another week's worth for him. I'll let you know more details when I get back. Aw poor little thing I know somebody said it only takes two weeks to heal birdbones, but this is a hipfracture. He has to stand on his feet and use them in order to do anything. So I guess it might take longer for it to heal properly? Sure hope the vet knows what to do. Give Truman a big cuddle from Holland!